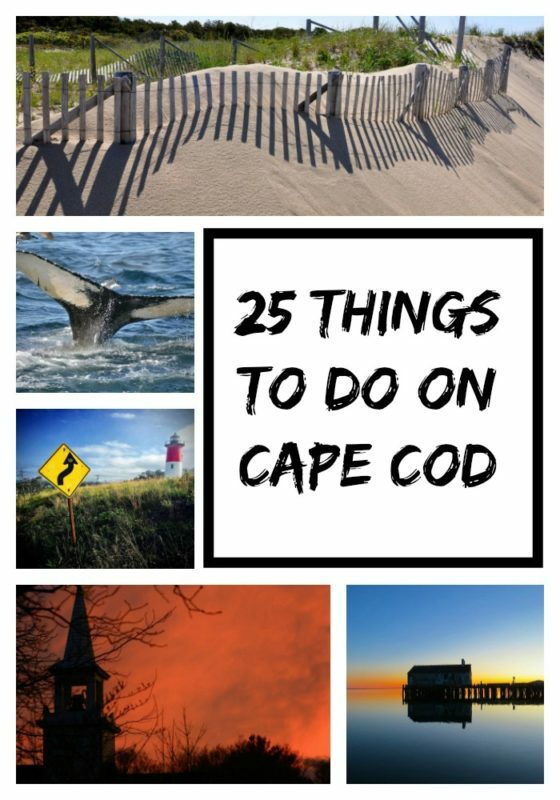 Here are 25 things to do in Cape Cod this summer! Wellfleet Drive-in – Enjoy the vintage welcome reel, mini-golf and a playground for the younger kids at this drive-in location where movies show twice a night all summer long. Cape Cod Rail Trail – this is perfect 22 mile trail for bicycles, rollerblades, horseback riding or walking if you want to experience the natural attractions. Cape Playhouse – if you can handle sitting at pews to enjoy a theater, this is a must visit location if you don’t mind the price, as it’s said to be a little steep but well worth it. Monomoy National Wildlife Refuge – feel like a trailblazer as you visit this location where you’ll see a decommissioned light hours, dunes and fresh as well as saltwater marshes full of wildlife. Heritage Museums & Gardens – have a gander around and enjoy the amazing antique automobiles, a vintage carousel ride for the kids and gorgeous American folk art. Edward Gorey House – informative tours of the works of Gorey who’s known for his eclectic personality and illustrations in T.S. Elliott’s “Old Possum’s Book of Practical Cats”. Pilgrim Monument – this is the tallest all-granite structure in the United States and is a wonderful piece of history that commemorates the site of the Mayflower pilgrims’ arrival. Cape Cod National Seashore – the East shore of the Lower Cape was designated as a national park in 1961 and is now known for some of the best beaches on Cape Cod. Art’s Dune Tours – enjoy a tour in old four-wheel style Suburban’s as you enjoy the lunar landscape and dunes of Provincetown. Blue Claw Boat Tours – take a boat tour where you can enjoy the view of seals in their natural habitats or enjoy a romantic sunset cruise for two. Cape Cod Museum of Natural History – learn more about the ecology of the Cape where you will find demonstrations from the resident beekeeper and naturalists. Catboat Rides – the native Captain Marcus Sherman has been taking people out sailing in Hyannis since 1989 where you can get closer to the island sites than on any other ship. Kennedy Compound – this property is still owned by the Kennedy family so it’s private property but you may enjoy sightseeing by venturing to its location to get a glimpse. Woods Hole Science Aquarium – operated by the National Oceanic and Atmospheric Administration with over 140 species on display this is the country’s oldest research aquarium. Lighthouse Beach – this is the perfect beach for long walks and some kite flying, seated beneath the iconic lighthouse in Chatham, this is a great place to relax. Nauset Beach – this is an easily accessed beach in the Cape that many enjoy because you can park close to the beach, with just a few steps to be on the warm sandy shore. Dolphin Fleet Whale Watch – enjoy a four hour boat ride that visits the humpback whale’s feeding area where you may spot some whales or native wild birds along the seacoast. Skull Island Sports World – this arena is a fabulous place for the kids when visiting Cape Cod, offering driving ranges, softball cages and little go-karts to enjoy. Bonatt’s Bakery & Restaurant – while this isn’t a site to see, we hear the rolls are just divine at this restaurant, a must dine location when in the Cape. Shining Sea Bikeway – rent a bike and enjoy this seacoast stroll of 11.5 paved miles of adventure with weaving paths and natural woodlands along the route. Beech Forest Trail – wind through fragile sand dunes as you enjoy this one mile walk anytime of the day to calm from an adventurous day in the Cape. Briar Lane Jams & Jellies – forget vegetable stands, this air-stand that sits along the highway is a great place to stop and enjoy some local jams and jellies. Chatham Squire – if you’re looking to enjoy some nightlife in the cape, this is the place to be, with live music and decorated license plates from around the world you’ll have a fantastic night. Coast Guard Beach – get out that boogie board because this beach is known for its high waves that allow surfers and boogie board enthusiast to have a little beach time fun. Whatever you decide to add to your Cape Cod’s vacation itinerary this summer season, be sure to choose some of these popular locations I shared today. Cape Cod is a great summer vacation family tradition to start now because it’s fun for all ages. I have never been to Cape Cod and I have heard that it is amazing. I would love to see everything you mentioned here. I need to work my way out that way. We’re hoping to get out to Cape Cod this summer, so I am definitely bookmarking this. Thanks for the awesome picks. My husband and I talk a lot about going to Cape Cod. It just looks so beautiful! I need to save this post! I have never been to Cape Cod but the quaint beaches and shops sound so interesting. I would hope to have a great guide to take me around if we go. For someone who lives like an hr away from the Cape, I surely don’t visit enough! I need to make a trip there so I can have an excuse to go to my fave home store! Nice to see a big list of some fun things to do there. This is one of the places I’ve always wanted to go. It sounds like it would be really fun. I have always wanted to go – especially because I have the Florida beaches here near me but I’d love to see how other beach stack up! My uncle’s family used to have a home on cape cod. I wish they still had it when I would have been able to go. We love Cape Cod! These activities sound so fun! I had no idea there are still lots of things to try on Cape Cod that we haven’t tried! We have never been to Cape Cod to explore and look around. You have listed many different things to enjoy for anyone wanting to visit Cape Cod. I have never been there but I would love to go this summer. I hope to use this post on a trip to the cape. We love the Cape, it’s very beautiful there. I will keep this list in mind when we visit! Oh wow!!! This looks and sounds like an awesome place to visit. I think that we would like the Pilgrim Museum but also the other places on this list. Time to plan a vacation to Cape Cod! I’ve never been to Cape Cod, but I’ve been meaning to go. I know it’s lovely there and your list shows me there’s tons to do! We might take a vacation to that area soon. My kids would love all the sea food options. Thanks for sharing this list. I’m hoping to visit Cape Cod this summer with my family. Can’t wait to check out some of these places. I’ve never been to Cape Cod and have always wanted to go there at least once. You have some great suggestions for things to do there. It’s too bad you can’t tour the Kennedy Compound – I would love to get a glimpse, but I would love to see inside too. Cape Cod would be a beautiful place to visit in the summer! The Bonatt’s Bakery & Restaurant sounds like a place my entire family would appreciate. We love anything that has to do with pastries and bakeries! Oh gosh, I would love to travel to Cape Cod one day!! Maybe later this summer??? This place seems to be very family-friendly. It’s a must-visit for those who have a heart for adventure and those always on the lookout for thrills. The Briar Lane Jams and Jellies sounds like an awesome place to stop by for SOME SWEET PLEASURE. gREAT LIST, WE HAVE NEVER BEEN THERE YET. This post is perfect timing for me. My family and I are considering going to Cape Cod this summer. I am totally saving your list! It’s a lovely destination for families because although they have a lot to offer, you still get the rest and relaxation that you need. You can go and enjoy the different activities or choose to relax at the beach. Whatever it is that you like doing here, I bet it’s going to be one awesome vacation! Unfortunately, i believe Bonatts has closed permanently. Please fact check me but that was the last i heard about the famous meltaways! I’ve never been to Cape Cod, and it’s officially on my bucket list. I’d head to Lighthouse Beach first. I love anything related to lighthouses and the beach. I’d then to go Heritage Museums & Gardens. I want to do all of these one day.